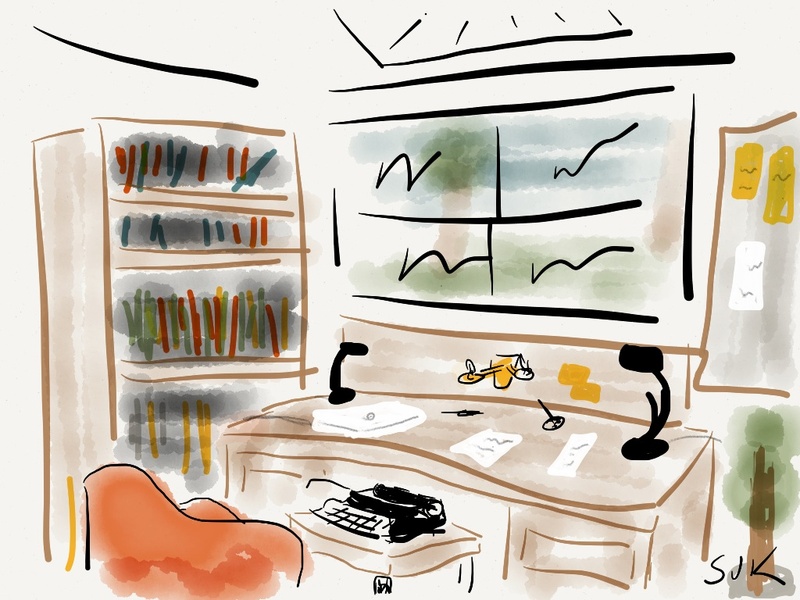 A space to write my own…. Yeah… a break from the Charleville trip for a bit. I was happy to see the Strikethru blog suddenly (briefly) power up again and get the typosphere buzzing. I have to say, that blog was one of the blogs that inspired me to start my own typewriter/writer blog. 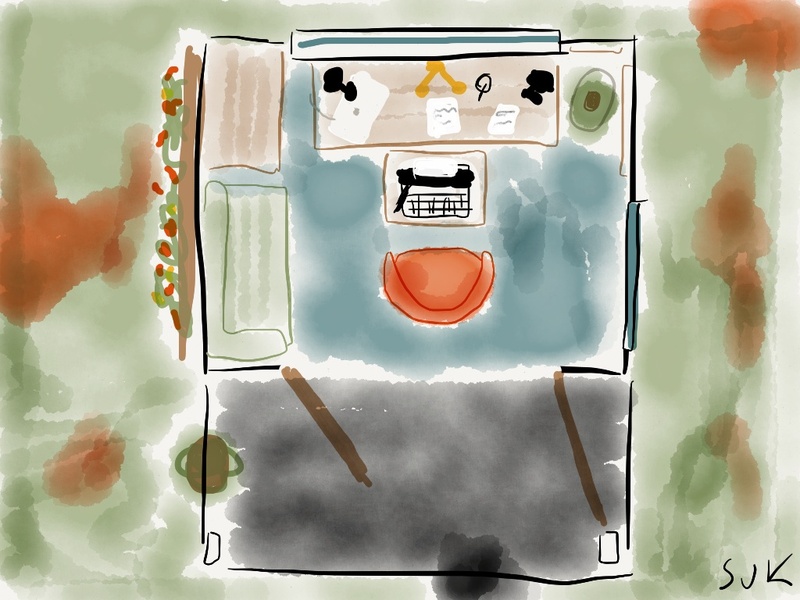 Last week when they challenged everyone to talk about what their ultimate writing shed/shack would be like, I found my imagination wandering again. Here’s the two Strikethru blogs about the subject – for those who haven’t seen it. They’re short, so feel free to brush up on them, but come back! Well, I started working more from the inside out, so I’ll just put my sketches up on here for everyone to have a bit of a sticky at. I found recently that a shorter semi-lounge armchair, and a ‘just right’ height side table felt almost perfect for me to write at comfortably. Probably not great for my back long term, but casual writing seems to flow on this kind of set up. Hence the setup with the chair and the typewriter. But I need a desk for the long slog. I’ve positioned a couple of lamps on either side of the desk, and a piano sconce on the wall behind it to give me that nice candle lit glow I sometimes just want. To the right, a couple of pin-boards to corkboard organize up projects. And naturally, an indoor plant – at least one, along with a nice chunk of inspirational reading on a bookshelf. (which might also hold a couple of typewriters – so I can write on what I feel like on the day. Oh yeah… and a sun-light through the ceiling above the desk. Possibly able to be popped open to let hot air out of the room. Small lounge at the back corner and a second window off to my right. French doors naturally. Actually, these doors hold a secondary purpose. They allow me to turn both the chair and the side table around, and point them out the door. If it is a nice day and I’d rather be facing into the breeze, sticking the table outside the door and sitting inside still in the shade, would be perfect. The back left hand corner will probably need to accommodate a fan from time to time. Yep… That was a laptop on the desk back up there. My workflow often requires me to need a tool like that, even if I usually just use my iPad these days. But a solar panel on the roof, and some strategic low-power LED lighting will make this the perfect little spot to sink a few coldies after the sun goes down. Letting a couple of plants creep up the sides – maybe grape vines – would probably take a good chunck of the heat from the Australian summer sun from the building. So that’s it folks. I hope you enjoyed my ideas. They’re only the beginning, and if I ever get the chance to make myself a shack, I’m sure I’ll come up with something even more elaborate. But these represent a few key things that I’d like to have. 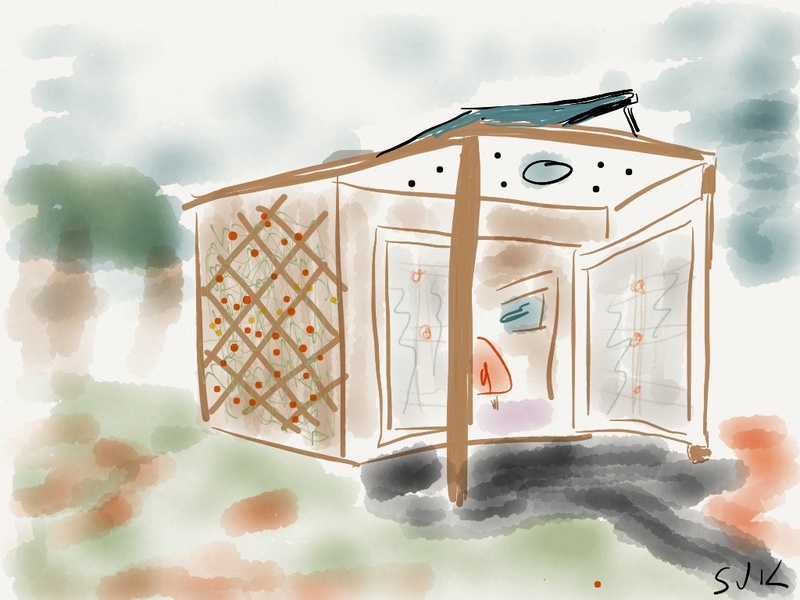 August 6, 2012 in beer, desk, destination, man cave, shack, shed, solar, writer's getaway, writer's shack, writer's shed. Pretty nice sketches. You should definitely build something like that. By the way, in the same way that strikethru inspired you to start your blog this one inspired me to start mine. I should do a sketch up too. Hmmmm. Drawn with Paper by 53? Those are great sketches, wow. Wish I was that good drawing with the iPad. My sense of perspective is dreadful. Love the sketches, they remind me of Ludwig Bemelmans' art. Really? I'd better check out the result! Cool! Mmm? Drop me a line if you post some up, I'd love to see them! Yep, you've got me. Paper by 53 is my go-to these days to sketch up projects. I can't recommend it enough. Although, I only have a dodgy stylus that came with a phone case to use with it. But a stylus helps a little bit. And don't be so harsh on your own talents! I've seen some of your sketches in the past, you're hardly talentless. And thanks for dropping by! Yeah. I'm the kind of guy the feels cozy in clutter. I'm not one for sheek surfaces, sharp and angular furnishings and empty; brightly lit space. I need a world of exploration, not coolhunterness. Oh, that's extremely flattering of you. I just wish I had that much extraordinary talent, and ability to create such character. Your plans and sketches are great! Best wishes for manifesting them on the physical plane!